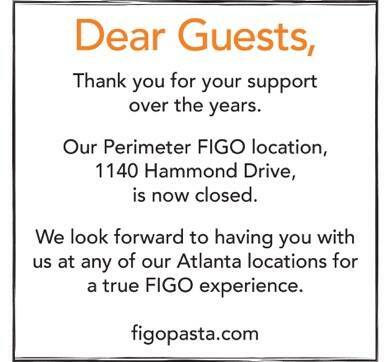 FIGO Pasta on Hammond Drive in Sandy Springs has closed. FIGO, the Atlanta-based pasta chain, has closed their location at Perimeter Town Center in Sandy Springs. The center is located near the intersection of Hammond Drive and Peachtree Dunwoody Road and is also home to a bi-level Uncle Julio's Mexican restaurant, among other tenants. The 3,200 square foot restaurant opened in late 2009 and closed as of September 30th. Following the Sandy Springs closure, FIGO is down to just five locations: West Midtown, Buckhead, Decatur, Edgewood and Vinings. FIGO previously closed locations in Alpharetta on North Point Parkway near North Point Mall and on Virginia Avenue in Virginia Highland. A location planned on Broad Street in downtown Atlanta was announced and started, but never opened. Replacing FIGO in Sandy Springs will be "Curries Indian Kitchen," a new full-service Indian eatery. Curries will reportedly feature moderately priced Indian fare, served family style. The Shumacher Group, Inc. and Steve Josovitz represented FIGO in the transaction. Sources indicate that Curries will feature a tandoor and will offer house made naan and samosas, among other specialties. Although similar in name and logo, Curries in Sandy Springs is reportedly not related to Curries Indian Kitchen, a restaurant in Cookeville, Tennessee. Curries will join Bawarchi Biryani Point, in Abernathy Square, in offering Indian fare in Sandy Springs. Moksha Kitchen, a popular Indian restaurant from Duluth, opened a satellite location in Sandy Springs in 2014, but it closed the following year. In Toco Hills Promenade, Mirko, a restaurant similar to FIGO, was later converted to Osteria Cibo Rustico, similar to both. Last year, the Italian restaurant also gave way to Indian: Masti - Fun Indian Street Eats, from the owners of popular Indian eatery Cafe Bombay. Are you excited for another Indian option in Sandy Springs? Will you miss FIGO? What is your favorite Indian eatery in Atlanta? Figo Sandy Springs was our annual carb loading spot every July 3rd. But after 3 straight substandard visits, we opted for Maggianos this year. It's too bad, I used to enjoy Figo. But you just can't provide mediocre food with painfully slow and inadequate service and hope to survive out there! Is there a source stating that the Figo Pasta will not open downtown? When I was on Broad Street last week they had a sign on the street mentioning Figo, as well as three other eateries destined for the building (this is on the building's website as well). It does appear though that the location is now planned to be a to a "to-go" location, something that seems new for the chain. I hope it shows up in some form, there's definitely a demand for more good lunch places on that block! I never went to this location of FIGO but still miss the Alphareta location that closed. I'm not excited at all about an Indian restaurant. Maybe I was spoiled by great, homey yet professional Indian neighborhood joints in DC. What I would call mid-line, $15-$20 entrees, competent table service, and tremendously proud of their fare. You never seemed to be more than 20min. away from that sort of experience. That seems like a tough location for a restaurant like Figo. I think the places around there survive on the lunch crowd from the office towers and a big heaping bowl of pasta isn't what a lot of people want for lunch. The few times we have gone over there for an Uncle Julio's fix on the weekends that area of Sandy Springs/Dunwoody is a ghost town, very little nearby residential and too far from Perimeter Mall to attract traffic. Bring on the Indian! Would prefer a higher end curry house though similar to Bhojanic in Buckhead. There are enough family style/hole in the walls in the surrounding area. This place will do well with all the overweight IT staff at the new State Farm HQ. LOL on the overweight IT staff. Listen, Biryani Point is SERIOUSLY lacking in customer service. The best models for customer service in the Indian kitchen segment are absolutely Himalayas in Chamblee and Viceroy in Dunwoody. That said, now that Figo is gone I am sincerely hoping that leaves an open for the real deal Mirko to expand into Dunwoodyish. Brookleigh market would be perfect for Mirko. Can't believe Brookhaven Provisions is still in business with their gross cluelessness and disorganization, had so much promise I am disappointed. Thanks Eli for this forum. Me reader long time. Viceroy is a good place. And the owner is a gem. Viceroy is awesome. Loved Himalayas but traded it in for Moon (previously Royal India) in Five Points corners just next to Brookleigh. Agree on Brookhaven Provisions, is is a bar, is it a supermarket, is it a lunch spot, no its a mess. Marlows might kill it once it opens.